"Python and Hadoop: A State of the Union"
"Introducing Apache Arrow: A Fast, Interoperable In-Memory Columnar Data Structure Standard"
"Introducing Apache Arrow: Columnar In-Memory Analytics"
As the original author of both read_csv and HDFStore, these benchmarks make me very proud, but it also shows what level of data access performance pandas users should expect in general. So more than 90% of the execution time is data serialization. Data is transferred in a form that is expensive to deserialize. Data is passing through scalar Python objects (i.e. using DataFrame.from_records on a list of tuples) rather than going directly into pandas objects at the C API level. 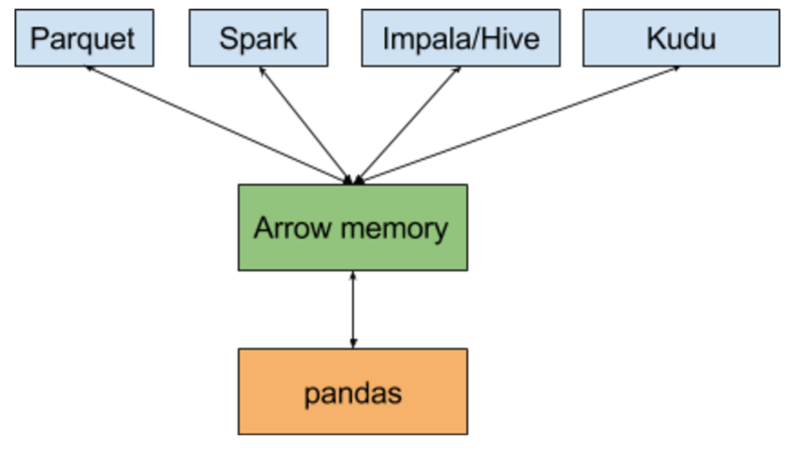 Realistically, the performance of ingesting data into pandas via Arrow should be significantly faster than reading a CSV (being binary and columnar). It's important to note that using pandas.read_csv as a standard for data access performance doesn't completely make sense. Parsing a CSV is fairly expensive, which is why reading from HDF5 is 20x faster than parsing a CSV. The Apache Parquet data format is a column-oriented binary storage format for structured data optimized for IO throughput and fast analytics. Since it was designed primarily for use in a MapReduce setting initially, most development energy was poured into the parquet-mr Java implementation. Last month I started getting involved in parquet-cpp, a native C++11 implementation of Parquet. I'm pleased to report we've made great progress on this in the last 6 weeks, and native read/write support for pandas users is reasonably near on the horizon. I'll report here when I get the whole thing working end-to-end. Data access performance is only one area where Arrow will help the Python ecosystem. High performance Python extensions and native in-memory handling for nested columnar data will also make a big impact. I look forward to sharing ongoing progress updates.